MSNBC-December 1, 2011: For two Florida municipal employees, an alleged plan to cast a Santeria supernatural spell on their boss was anything but super. Due to some supposedly mystical birdseed and a janitor who blew the whistle on the seedy hex, one employee has been fired from her post at the North Miami Police Department and a recommendation for termination is pending for the other. Veteran police officer Elizabeth Torres and office manager Yvonne Rodriguez's curse was to take place in August amid budget cuts and planned layoffs, but the layoffs never got past the planning stages. "We were looking at a reduction in staff of about 9.4 percent, so everybody was on edge," North Miami Police Department Public Information Officer Mark Perkins told msnbc.com. "The two employees were conspiring to place birdseed in the city manager's office to get him to leave, the belief being that if you sprinkle birdseed around it, it will make the person - any person- want to leave." But since they didn't have access to City Manager Lyndon Bonner's office, the two approached a janitor, hoping they could recruit her to sprinkle the seeds, which they later told investigators is a Santeria ritual. Esther Villaneuva, the janitor, was working her night shift on Aug. 29 when Torres and Rodriguez approached her with a container full of seeds, according to the department's internal affairs report. It was the first time Villaneuva had ever had a conversation with the two women, Villaneuva said. Torres told her to "just take a little bit of the birdseed and spread it," according to the department's report. Villaneuva said no, expressing worry about the security cameras monitoring the office, and also whether something bad could actually happen to the city manager. Torres allegedly told her, "No. Nothing's going to happen to him. He's just gonna leave. It's just going to make him leave. Don't worry, nothing bad is going to happen to him." Torres even allegedly told her that she had used birdseed in her own house in the past, and it had resulted in her son and daughter going away for a couple of weeks. When Villaneuva asked Torres why she didn't just spread the birdseed herself, Torres told her she didn't have an excuse for being in that part of the building at that time of night. Villaneuva refused the request and told her boss, prompting an investigation that eventually led to Rodriguez, the office manager, getting fired last week. "The police officer has union protection, the office manager does not, so technically, the police officer still has not been terminated, although recommendation for that is pending," Perkins said. Officer Torres will go to court for her appeal on Monday, he added. Both maintained the plot was harmless, according to transcripts in the internal affairs report, which the North Miami Police Department released Wednesday. Torres, who has worked as a North Miami police officer since 1987, told investigators, "I want to clarify that it's nothing malicious and nothing intended to hurt that person. 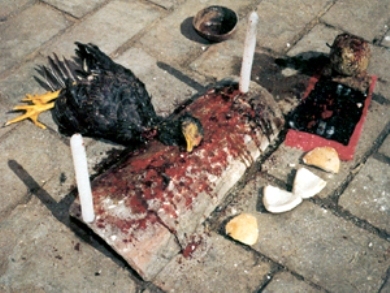 Just, just it can be viewed as either a superstitious practice or a religious practice in the Santeria religion. This is something I was raised with as a child, all these superstitions and this quasi-religion." Rodriguez initially denied involvement in the plot, department spokesman Perkins told msnbc.com, and was fired for "conduct unbecoming." She has worked for the department since 1996. "The second time, she told the truth," Perkins said. "If you work for a police department, spells are not an option." According to the report, Rodriguez said she didn't provide accurate information in the first interview because she feared getting in trouble. Santeria or La Regla Lucumi is an Afro-Cuban religion originating in West Africa in what is now Nigeria and Benin, hailing from the traditional culture and worldview of the people now known as the Yoruba. The slave trade brought many of these people to the shores of Cuba, Brazil, Haiti, Trinidad and Puerto Rico among others. But along with the bodies being brought over for sale into a life of misery, something else was being brought along. Their religion. Santeria is not a dark religion. On the contrary, the Yorubas are considered to be a very civilized people with a rich culture and deep sense of ethics. Santeria is considered to be the light and not to be confused with Palo Mayombe, which is the dark. The Yroubas believe in one god known as Olorun or Olodumare. Olorun is the source of ashé, the spiritual energy that makes up the universe, all life and all things material. Olorun interacts with the world and humankind through emissaries. These emissaries are called orishas. The orishas rule over every force of nature and every aspect of human life. They are approachable and can be counted on to come to the aid of their followers, guiding us to a better life materially as well as spiritually. Communication between orishas and humankind is accomplished through ritual, prayer, divination and ebó or offerings (which includes sacrifice). 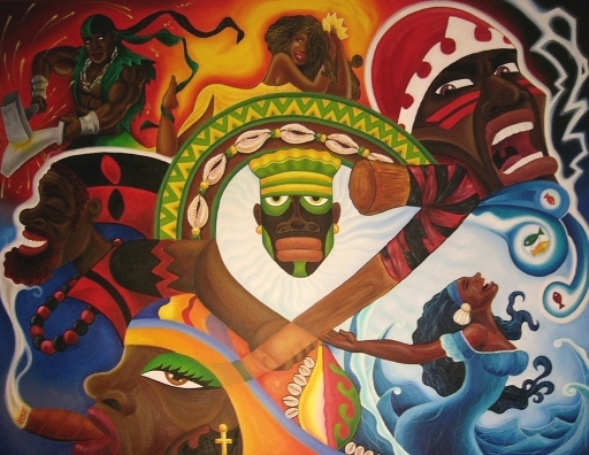 Song, rhythms, and trance possession are also means with which we interact with the orishas and how we are able to affect our day to day lives so that they we may lead deeper and fuller lives during our stay in this world. In the New World, many slaves practiced Santeria. The orishas and much of the religion were hidden behind a facade of Catholicism with the orishas themselves were represented by various saints. Sometimes slaves would be praying to Shangó, the Lord of Lightning, fire and the dance, perhaps even praying for deliverance from their slaveowners. This is how the religion came to be known as Santeria. The memory of their slave history is also why many in the religion regard the term Santeria as a pejorative and derogatory. La Santeria is famous for its 'magic.' 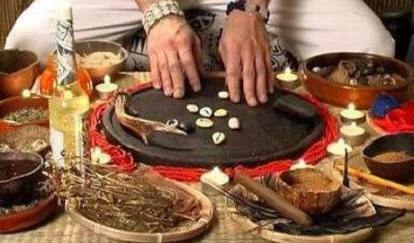 This magic is based on a knowledge of the mysteries or orishas and how to interact with them to better our lives and the lives of those who come to us for the aid of the orishas. They live under the premise that this world is a magical one. This knowledge seems 'supernatural' only to those who don't understand it, but it really is quite natural. In the Santeria religion, there exists a dark side called Palo Mayombe. It originated from the African Congo and is said to be the world's most powerful and feared form of black magic. Individuals who practice this dark aspect are called Paleros. The differences between Palo Mayombe and Santeria is that the religion of Santeria uses the forces of light and the members of Palo Mayombe use their forces of darkness to achieve their goals with magic spells. The house of the dead is where the Palero spirits reside. Paleros are said to practice extremely strong and powerful black magic. Many members of Santeria avoid being associated with Palo Mayombe. Palo Mayombe has its own priesthood and set of rules and regulations. It is an entirely different world, outside of the Latin American spiritualism.